Power Energy and Business Development Minister Ravi Karunanayake yesterday said that he will allow civil society activists against corruption to monitor his ministry activities to bring corruption to zero level. He said that civil society activists against Corruption should monitor his ministry activities regularly and point out any corrupt activities are taking place. “This initiative will help carry out ministry activities including financial transactions in a transparent manner and prevent malicious and fake allegations aimed at the Ministry,” he said. Karunanayake added that civil society activists against Corruption such as Ven. Ulapane Sumangala Thera of Anti Corruption Front, President of National Movement for consumer rights protection Ranjith Vithanage, Nihal Kiriella, Attorney at Law Pradeep Perera , Vimukthi Dushantha should question the activities of his ministry and pinpoint if any corrupt activity is taking place. “This measure will help reduce corruption in government institutions. Other ministries should also follow this initiative. I don’t want a lot who say “yes” or “No” to everything,” he said. The Minister was speaking at a meeting with ministry officials held at Ministry premises yesterday. The Minister stressed importance of making the institutions coming under his ministry more efficient and productive. The Minister questioned whether Sri Lanka has economic freedom, though seventy one years elapsed since country was freed from the shackle of colonial powers. “Those who are working tirelessly for the country, are being targeted We have assured that electricity tariff will not be increased under any circumstance”, he said. President Maithripala Sirisena did not attend Parliament sittings yesterday though he was present in the Parliament complex to chair the Cabinet meeting. Sources said the President had to leave the Parliament premises in a hurry as he had a busy schedule yesterday. However, sources said that the President would attend Parliament sittings tomorrow (7) and most probably he would also address the House. The Determination under the Constitution to increase the number of ministers by forming a national government is expected to be moved tomorrow. The President is required to attend Parliament sittings at least once in three months according to the 19th Amendment to the Constitution. JVP Leader Anura Dissanayake brought to the attention of the House during the previous Parliament sittings’ week that the President had not attended Parliament for more than three months now. The fourth consignment of pharmaceutical drugs will be airlifted this week in the wake of the prevailing drug shortage in the country owing to the 52-day Constitutional coup, Health, Nutrition and Indigenous Medicine Minister Dr.Rajitha Senaratne said. Responding to a question by JVP MP Dr.Nalinda Jayatissa in Parliament yesterday, the minister said it would take another 3 or 4 months to completely resolve the medicinal drug shortage at government hospitals. The Minister said no Letter of Credit had been opened during the 52-day long political crisis to import any pharmaceutical drug to the country as there was no authority to give directions. Minister Senaratne said there was a shortage of 82 varieties of medicinal drugs when he resumed work in his ministry following the Constitutional coup, while a shortage of another 200 varieties of medicinal drugs was about to occur. “A consignment of cancer drugs was airlifted on December 24 understanding the gravity of the issue. The second consignment of drugs was airlifted on December 27 and a third on January 1,” he said. “The purported government appointed on October 26, 2018 had done nothing to bring necessary drugs when there were signs of a possible drug shortage. I even informed the President about a possible cancer drug shortage 12 days after the Constituional coup, but nothing had been done,” Dr.Senaratne said. JVP MP Dr.Jayatissa said many government hospitals do not have the anti-rabies vaccine as at now. “Patients who had kidney transplant operations do not have necessary drugs to consume. This issue must be addressed immediately,” he said. Meanwhile, Parliament was told that the Government had spent Rs.13 billion, Rs.17 billion and Rs.14 billion respectively in 2015, 2016 and 2017 to import medicinal drugs. However, the number of drug varieties imported to the country had been reduced by 206 from 1052 in 2015 to 846 in 2017 by increasing local manufacturing. 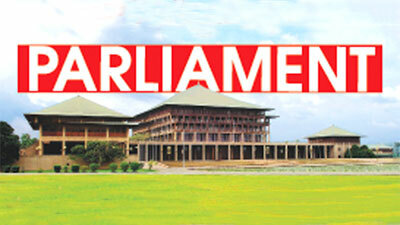 JVP-MP Bimal Ratnayake urged the President to release the remaining reports of the Bond scam. He also questioned as to why Mahinda Rajapaksa did not release the rest of the Central Bank Bond scam report during the 52 days that he was the Prime Minister. Seconding the Adjournment Motion in Parliament yesterday, he said, “Since an election is to be held at the end of the year, we urge that the Mihin Lanka Commission report and the report of the Commission appointed recently to inquire into corruption of the current government over the past three years be released as soon as possible,” Ratnayake said. He noted that it was no secret that all those who had governed this country over the past 50-60 years from both parties had robbed the country of unimaginable amounts of its wealth. “But, none of these powerful and wealthy perpetrators were ever found guilty or have had to face punishment. However, today, reputed judges and lawmakers have at least revealed the names of these perpetrators. If we take into consideration those found to have committed offences as revealed in the over 1,100 pages of this report, I thank the panel members of this Commission and all investigating officers for having carried out this task commendably. They have not only fearlessly investigated the powerful figures involved in these crimes, they have also recommended the punishment that should be meted out to them,” he said, noting by what is published in this report, it is sufficient to charge those found guilty of these offences. He said there are 34 offenders named in this report from both sides responsible for billions of rupees of the ordinary people’s money. He accused the current government of protecting the offenders and giving them ministerial positions and keeping them in the government. Referring to social media reports of Arjun Aloysius, attending the wedding of Rajapaksa’s son, he accused members of both main parties of maintaining relations and protecting these criminals who had robbed the country. Justice and Prisons Reforms Minister Thalatha Atukorale said in Parliament yesterday that the process of hanging those sentenced to death for drug related offences is in limbo pending the approval of the President. She said the Attorney General’s Department had cleared the names of five death row inmates who were convicted for drug related offences and the reports had been sent to the Presidential Secretariat for the President’s approval. Opposition Leader Mahinda Rajapaksa questioned the Justice Minister whether the Presidential Secretariat had responded, but she said no response had been received. Minister Atukorale said that there are 48 convicted prisoners sentenced to death by hanging for drug related offences. “Of them 30 have appealed against those sentences and their cases are pending. There are 18 others who sentenced to death by hanging. In September 2018 we sent their files for further clearance to the Attorney General’s Department which in return sent us two names on Oct 12, one name on Oct 22 and another two names on Dec 2. We sent all those files to the Presidential Secretariat, but so far we have had no response from them,” she said. In response to a question raised by UPFA Kurunegala District MP Dayasiri Jayaserka, the Minister said that there were 1,249 inmates sentenced to death and of them 876 had appealed against their sentences. When asked for the number of those sentenced to death and how many of them had been pardoned since 2010, she said none of those on death row had been released or pardoned. The MP asked whether the system of granting amnesty through periodical review of death row prisoners every 4 or 8 years which was implemented during the period that capital punishment was abolished, is still operative. The Minister said that review reports are ordinarily submitted in respect of the inmates on death row. With the gallows being suspended, the system of granting amnesty has been implemented under special Presidential pardon or on the recommendation of a committee appointed by the President. The review reports of four years, eight years, 12 years and 20 years are submitted to the Ministry of Justice. Responding to objections raised by opposition MPs Vasudeva Nanayakkara and Wimal Weerawansa that the PRECIFAC report was not made available to them in Sinhala, TNA MP- M.A.Sumanthiran said in Parliament yesterday that the PRECIFAC report on which the Adjournment Motion was fixed yesterday was originally in Sinhala which was presented to the House almost a year ago. “On that occasion there was an Adjournment debate to be held on two reports and not one. One was the Bond Commission report and the other was the PRECIFAC report. The Bond Commission report was in English and the PRECIFAC report was only in Sinhala. Prior to taking up the matter in Parliament, there was an agreement at the party leaders meeting that we will not insist on Tamil and Sinhala translations, and as long as these reports are in English it can be debated. When the matter came up, the PRECIFAC report was only in Sinhala and the objection I raised at that time was not that it was not in Tamil, but that it was not at least in English as agreed at the party leaders meeting. I did not raise any objection with regard to the Bond report. It was being consistently told to the country over a whole year that I stopped the Bond Commission report, which is far from the truth. I did not say a word about the Bond Commission report as it was in English. Now that both these reports are now in all three languages. That is why I raised this again in January and wanted a debate as constantly false information is being given to the country that I stopped the Bond Commission report debate,” Sumanthiran noted. Raising a Point of Order, MP Vasudeva Nanayakkara said Sumanthiran cannot create new provisions except the provisions in the Constitution. He said it had to be in both Sinhala and Tamil. However, Deputy Speaker Ananda Kumarasiri said as it had been agreed at the party leaders meeting, he allowed Sumanthiran to go ahead and present the motion. In the 600 page detailed report there were 401 complaints made and after sifting through those complaints the commission entertained 1,599 complaints with regard to 34 institutions. Further mentioning a few others, he said the Commission had named parties responsible for irregularities at Rakna Lanka and Avant Garde Maritime Services as well which includes Major Gen. Palitha Fernando, Nandasena Gotabhaya Rajapaksa, Nissanka Senadhipathy and various others against whom findings had been made. He said the government which came into power in 2015 on the foundations that they would go after all those who have misused public property and resources. “Today, we are unable to ascertain whether any one of these recommendations of the Commission report have been acted upon. A salutary fear of this report is that not only has it recommended punitive action against those responsible, but in part three of this report they have recommended measures that needs to be taken to avoid this kind of misuse of public funds in the future. They have even gone to the extent of how to educate children as a change of culture with regard to their responsibility with public funds,” he said, adding that however, no action has been taken to implement these excellent recommendations.